Registrar of Voters Debbie Waskom said Tuesday morning the first day of early voting had been steady. Voters were lined up on the courthouse steps waiting for the registrar’s office to open at 8:30 a.m.
Contests in the majority of school board seats as well as heavily contended local municipal races combined with high visibility statewide races including Secretary of State, US Representative 4th Congressional District and a proposition to authorize Fantasy Sports contests, mixed with the highly debated unanimous jury and state police funding have residents making their way to the polls. 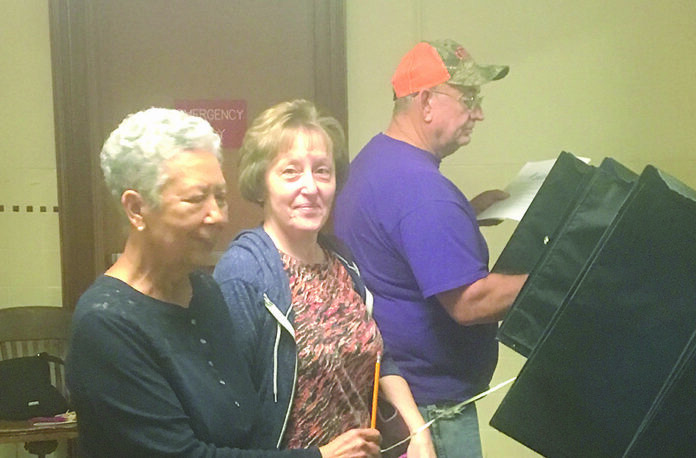 David Williamson cast his ballot Tuesday morning. Registrar’s offices throughout the state have been busy the last few weeks processing new registrations and updating information for current voters. As the deadlines for both in person/mail and then, online approached, the numbers of new registrations and updates increased steadily. Natchitoches Parish has 24,720 registered voters, with 11,736 registered Democrats, 6,681 registered Republicans and 6,303 registered as Other Party. Early voting for the Nov. 6 election began Oct. 23 and will run through Saturday, Oct. 27, and again Monday-Tuesday, Oct. 29-30. Hours for early voting are 8:30 a.m. to 6 p.m. This year, there is no access to the Courthouse from St. Denis Street. Handicapped voters can park in the Sheriff’s Department parking lot and come in through the Sheriffs Office. A total 590 people voted Tuesday. Of those 402 were white, 166 black and 22 other race. More women voted Tuesday with 317 casting ballots to 273 men. Democrats led the parade into the courthouse with 312 followed by 204 republicans and 74 other party votes cast. Of the 590, there were 375 in person voters and 215 absentee ballots counted. If you have questions concerning voting call 318-357-2211. Registrar of Voters Debbie Waskom validates a card for an early voter to use in the voting machine. She said there was a steady stream of voters Tuesday morning. For a complete breakdown of the amendments and local ballots, visit www.natchitochestimes.com and click the “Elections” tab.